TOOOL stands for The Open Organisation Of Lockpickers. According to their website they’ll be holding a LockCon event in October 2019 in The Netherlands, which is where the organisation was founded. The group admits, and seems to enjoy, that it is under suspicion, and they claim that agents of the law attend their events under cover. They also claim to expose vulnerabilities in manufactured locking systems. They thereby provide a public service. They can also help people who have legitimately lost their key to the front door or safe. A combination lock is made up of a series of metal disks with grooves and notches in them. The disks move freely around a common axis but there is only one alignment of the disks that will permit free movement of a spindle in order to engage or release a catch. Key-operated pin-and-tumbler locks work on a similar principle of alignment. The combination of notches and grooves along the key have to correspond with the position of a row of spring-loaded pins of different lengths in the locking mechanism. When you slide your key into the lock you position it within a cylinder. The correct key in the lock allows the cylinder to rotate and engage or release the latch. The numbers visible on the spindle of a combination lock constitute a code, as do the invisible pin lengths on a key-operated pin-and-tumbler lock. Buildings and cities are imbued with such codes, not least at access points, ATMs, transportation hubs, security zones, etc. If locks are fascinating and addictive for lockpickers, combinations are also intriguing to the rest of us, especially if we think one or several of the combinations might provide access to something otherwise hidden. Combinations are of interest to architects and planners, and not just as they labour over key schedules. Think of the arrangement of rooms in a floor plan, perhaps a hospital floor plan, with many functions, relationships and constraints. Drawing an analogy with locks we might think that one arrangement provides the answer, the solution, i.e. the key. Floor plans are a bit like jigsaw puzzles. But in a jigsaw there’s only one combination of spatial elements (jigsaw pieces) that reveals the (hidden) picture, i.e. the solution to the puzzle. In the case of floor plans there’s not a single combination that provides the solution. We tend to think of a combination that provides an optimal condition, the best arrangement all things considered. That’s an operation in codes, though substantially less precise than arranging jigsaw pieces, or aligning spring-loaded pins in a lock to allow a cylinder to rotate freely. In so far as buildings and cities get configured, organised and disorganised as combinations, they are coded. They involve combinations. By this analogy, codes run deep in the structure of the city. Cities present as complicated combinations and arrangements of zones, buildings, streets, plazas, gardens, grids, signs and infrastructures. See post: Why hackers have to work hard. Manaugh, Geoff. 2016. A Burglar’s Guide to the City. New York, NY: Farrar, Straus and Giroux (Macmillan) See pp. 140-155 on TOOOL. 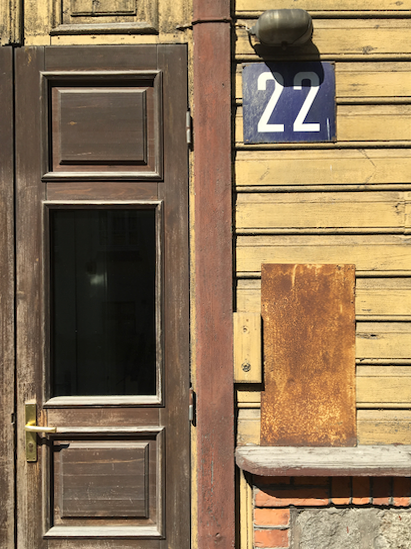 Door image: Tartu, Estonia July 2018.